Winter wedding cakes can be simple or extravagant. 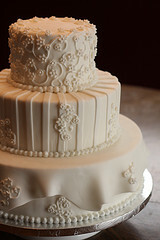 Whatever style you choose, your cake will be the center point of your wedding reception. The date of your winter wedding may help to determine the style of cake you choose. Not only does winter offer some great cake design opportunities, it also offers a few holidays that can influence your cake. If you are getting married around Christmas or New Years, for example, you may want to blend in seasonal designs like holly, reindeer and other festive symbols. Valentine's Day weddings offer the chance for you to use hearts in your cake design. 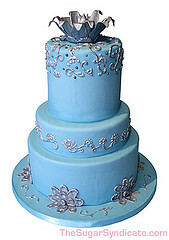 You may even want to have your cake designer create a cake shaped like snowflake or a giant Christmas present. Don't be afraid to have some fun and get creative with your cake. 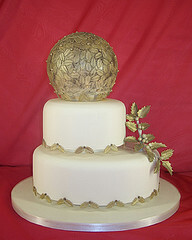 Pine cones and winter flowers, like poinsettia, also work well as cake decorations. Finishing off your cake with a cake topper ensures that your cake fits the season. 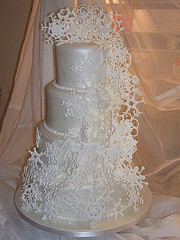 White is a traditional color for wedding cakes which works really well for a winter wedding. It’s ok to add some color if you want as well, like ice blue, to match your wedding colors. Below are two more examples of winter cakes.